Deb Canham “Roxie Feathers” Inbetweenie #16 Of 75 w/ Tag & Painted Canvas Bag. Condition is New. Shipped with USPS Parcel Select Ground. I believe she's a limited edition. It was difficult to get her color right when I took her picture. She is a very bright cherry red mohair, kind of like a Crayola Crayon color. I've given her a red bow. DCAD Cha Cha & Ching Panda Deb Canham Artist Designs. Credit for the item will not be issued until FairyTales-Inc receives the item in its original condition it was received. Designed by Deb Canham. 4pc Flump Dumpys collection. WHY 48 of 1000. WHERE 79 of 1000. WHAT141 of 1000. Snoopy Flying Ace is 3.5" tall and created in mohair, Flying Ace sports an aviator's cap and goggles and a red scarf. Limited to 200 pieces only. Credit for the item will not be issued until FairyTales-Inc receives the item in its original condition it was received. Sir Lancelot - #36 of 2500. King Arthur - #36 of 2500. Court Jester - #36 of 2500. Guinivere - #36 of 2500. He Is A Light Brown Mohair Bear And Wears A Blue Wool/Felt Jacket. He Is Five Way Jointed With A Stitched Muzzle And Paw Pads. The Boxes For These Older Pieces Do Show Signs Of Wear From Being Brought To Shows. DON'T YOU JUST LOVE THIS LITTLE FELLOW - He is LIWONDE by Deb Canham especially designed for the Sept. 2009 Safari Convention. He is #1 in a very limited edition of only 26 pieces! He stands 3.5" tall and is fully jointed. SARGIE Deb Canham, Hot Edition 3¾", Nov.2007, Brown mohair jointed bear wearing a red felt military jacket and blue felt pants and black felt boots. Gold braid decorations. Designed by Lynn Ellis for a Teddy Bear and Friends magazine design a bear competition. Consists of two pieces. William and Kate. This is CUBBY from Deb Canham. He is part of the 2003 Have a Heart Collection. He is No. 94/1000. His red cotton romper has black paw prints on it and he wears a felt orange and red beanie. However, they always stayed in their boxes, put away. ECCENTRICITIES Deb Canham Artist Designs, Mini Mice Collection 2½", 2004, Light Beige mohair, suede paw pads, ears and wired tail, red suede feet, dark blue star print sundress, red bow on bodice, red hat with red netting purple flowers. 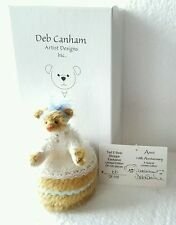 Pingle Bear by Deb Canham Artist Designs. Tin included with Bear. Credit for the item will not be issued until FairyTales-Inc receives the item in its original condition it was received. DEB CANHAM'S "SANTA FLUMP DUMPY" A 3 3/4"LIGHT BROWN MOHAIR BEAR-JOINTED-DRESSED AS SANTA. HE HAS THE LONG NECK AND FAT BELLY ASSOCIATED WITH THE FLUMP DUMP COLLECTION. HE WAS MADE IN A LIMITED EDITION OF 500 PIECES. Sits on a red velvet seahorse. both wear purple bows. Ping Wing by Deb Canham Artist Designs. Credit for the item will not be issued until FairyTales-Inc receives the item in its original condition it was received. DEB CANHAM Artist Designs CARROTS, Bunny COLL. New From Retail Store LE 3.75"